Elmo Cupcake Pictures Take a look at our Elmo cupcake decorating ideas. This was so easy to make them and it was fun. We used edible cupcake images. Edible images are just that, an edible piece of rice paper with a picture printed on it with edible ink. All you have to do is put them on top of your frosted cupcake. We did that and then rolled the cupcake edge in some red sparkling sugar to make it look really nice. Cupcake decorating ideas are easy and they don't have to be expensive. I got the edible images on Ebay. You can find everything you need to make some great party cakes there. 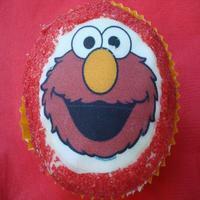 Here is the picture of our Elmo Cupcake. You can find everything you need to make a Elmo cupcake birthday treat for your next kids party. Just look at what Ebay has to offer...If you don't see what you want...Ask! The sellers on Ebay are easy to work with and will try to accommodate your needs. Another great cupcake decorating supply treasure chest is The Party Works. The Party Works is an online cake and cupcake decorating store where you can find cake toppers, cupcake toppers, edible images, sugar decorations and party supplies.